Every year, doctors prescribe hormone replacement therapy (HRT) — also referred to as menopausal hormone therapy — to hundreds of thousands of women experiencing menopausal symptoms. One of the most widely prescribed drugs for HRT is made from animal waste. The drug is Premarin, an estrogen-therapy drug manufactured by Wyeth Pharmaceuticals (now a division of Pfizer), which also produces Prempro. It also has a highly similar drug, Aprela awaiting FDA approval. These drugs contain conjugated equine estrogen (CEE) made from horse urine, specifically pregnant mare’s urine. 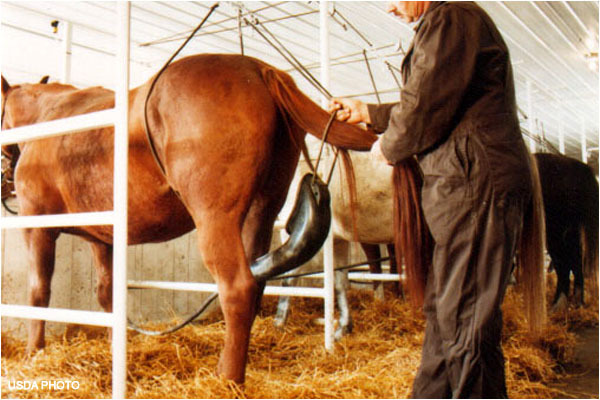 Not only has this form of HRT proved dangerous to humans, but also the horses kept confined, pregnant and milked for their urine. So many of their foals, taken away once they are weaned or nearly weaned, often end their young days in the slaughterhouse. — RON WILSON, son of the doctor who started the estrogen revolution. — PAT HOUDE, kill buyer and equine feed lot manager, regarding Premarin foals and mares. Join the Int’l Fund for Horses in their March for PMU Horses right here on Tuesday’s Horse to find out what you can do to make a difference. Yes, sad Lynne isn’t it? And with the downsizing of farms, people think the issue is over. Far from it. It is as bad if not worse than ever. At least some PMU mares and foals were being rescued while they operated the PMU farms in N. America. In the meantime, here is our Alternatives list. http://www.horsefund.org/pmu-alternatives-to-cee-drugs.php . We are looking to see if there is anything new to add to this before posting a list here for March for PMU Horses. NARAC I believe is alive and well but maybe another name. Vivian cites excellent alternative modalities for treating the symptoms of Menopause. You must cut beef, pork, and chicken out of your diet. All of these animals are given steroids (to make them grow faster) and antibiotics as they are kept in disgusting close quarters. Eating these will definitely impact the symptoms of Menopause. They will make you unresponsive to certain antibiotics as well. There are bio-identical drugs that can be taken, and they are lifesavers, its not just for vanity by the way. My Mom did not hit Menopause until she was 63! She took nothing, no HRT, she knew those drugs were terrible for women. She ate a lot of Yams, and other vegetables that have estrogen in them. It is not a disease. and it can be addressed by a good diet. This a.m. after reading your article, I went to the FDA website (via their Facebook page). Though their blog appears to be inaccessible (I tried several times) I came up with an ombudsman’s email. Sent your article and discussed briefly and asked for the name of an appropriate person to correspond with on this issue. If and when I ever hear from them, I will post under these comments. I am looking for the appropriate person to send this information to at FDA. I found your name and understand you are not the appropriate person but represent someone who works in reconciliation, so I am starting with you. This issue is of concern to a great many horse loving Americans. Do you have an animal welfare branch which speaks to the use of animals when producing drugs. These horse urine outfits do not appear to have much of an oversight that other animal facilities would. They are probably contracted out by the big companies (Wyeth/Pfizer) is my guess. The pregnant mares are discarded to slaughter with their foals and bodies are crushed and recycled. Please do you best to head me in the right direction to get this information to the proper personnel. I am a senior citizen living in Missouri who is an advocate of animal welfare but I am not associated with any group. Remember that if you shoot for the moon and miss you will still be amongst the stars. PS Thank you for article and thank you commentors for your knowledge and research! When did we start to treat menopause as a disease? When were these HRT drugs first developed and prescribed? As to side effects, my elderly mother was on HRT and was ready to have a stoke when the doctor finally noticed her blood pressure was skyrocketing. The Dr had simply left her on them for years and never checked again. Women have went through menopause for thousands of years or as long as modern females have existed. This is where the use of herbs was developed over time through trial and error. And there are a number of herbs over the counter that work very well, including some that work well helping you get to sleep. I think the main problem is that women have been taught that the doctor knows best and that can depend on whether the doctor happens to own stock in the company that is manufacturing the medications. I have at times been given samples of medication for a sore throat or sinus infection from the doctor’s office, all of us have at one time or another. These are given to the doctor to try out on his or her patients by pharmaceutical companies salesmen/women. But I have always wondered why cow pee wasn’t used instead of horse pee? Cows are kept pregnant year round and they produce the same estrogen that mares do. No one, and I mean NO ONE, can justify the suffering of the mares and foals in the PMU industry. No amount of personal discomfort, irritation, lack of sleep, or other transient issue can justify what mankind and this hellish industry seeks to capitalize on via poison pill.